ACOG recently released Seasonal Influenza Vaccination Programs: Tips for Optimizing Practice Management. This and other great resources are available online at the ACOG Immunization for Women website. Families Fighting Flu (FFF) has partnered with the National Association of Pediatric Nurse Practitioners (NAPNAP) and HealthyWomen to develop a Do You Know the Flu? comprehensive toolkit for pediatric healthcare professionals in an effort to increase annual flu vaccination rates in the pediatric population. FFF realizes that as healthcare professionals, you have a lot of responsibilities when it comes to your patients, only one of which is flu prevention. However, we know you understand how serious the flu can be, even for healthy people. And we want to help you make a difference in the fight against flu. Looking for an evidence-based method to help increase adult immunization rates? Wondering about using SOPs but don’t know where to start? The content for this comprehensive six-part series is available online 24/7, and it will help your healthcare setting implement SOPs for adult immunization. Speakers include immunization experts Drs. Deborah Wexler, William Atkinson, and Litjen Tan. Attending this series does not earn Continuing Education (CE) credit. The series is developed and provided by IAC, IDCareLive, and Pfizer. Registration is free but is required in order to view any session. The link will bring up a short registration form to create a free IDCareLive account, if you don’t already have one. After signing up, you will be transferred directly to the intended page. The European Scientific Working group on Influenza (ESWI) invites you to join other influenza stakeholders on September 28, 2018 in Leuven, Belgium, for a day of lectures and debates on pediatric influenza vaccination and immunization strategies. Different European countries have different immunization policies for children and this diversity stands in contrast with the overall uniform burden from influenza in children. All children are vulnerable to influenza and its complications. An estimated 20 to 30% of children get influenza every year. And many of them end up in the doctor’s surgery or the hospital. Participation is free of charge. Head to the Summit website for online registration or more information about the objectives and the programme. Ab Osterhaus, director of the Research Center for Emerging Infections and Zoonoses, Hannover, Germany. Sharon G. Humiston, MD, MPH, FAAP, IAC’s associate director for research, will present a one-hour webinar titled “Adolescent Immunization Update and the 16-Year-Old Platform” on September 26, at 1:00 p.m. (ET). During her presentation, Dr. Humiston will review the recommendations for adolescent vaccines, including those recommended at 11–12 years of age and those at age 16. CDC’s most recent National Immunization Survey, published on August 24, found that 51% of adolescents had not completed the HPV vaccine series, and 56% had not received both doses of MenACWY vaccine by their 18th birthday. In addition, fewer adolescents in rural areas, compared with those in urban areas, are getting these vaccines. On the Summit’s September 20h call, we heard from Sickweather about their upcoming national Cold, Cough, Flu Conference, to be held on October 15. Additionally, Sickweather is working on offering flu vaccines at the conference. The Kansas City Health Department is working on getting cooperation from Bird scooters to offer a discount code to their users who want to ride to the conference for a flu shot. They are seeking advice from Summit partners about previous experience on making something like this come together. Please email Laurel Edelman if you have advice or tips to share. Thank you for your long-standing participation and involvement in the National Influenza Vaccination Disparities Partnership (NIVDP). This partnership has served as an important collaborative catalyst to promote seasonal influenza vaccination among under-vaccinated populations. Through the years, the NIVDP developed and disseminated multiple communication resources and tools and connected underserved communities with influenza vaccine providers to bring greater awareness to the importance of annual flu vaccination. The CDC applauds the efforts of the NIVDP partners who worked to create sustainable annual flu vaccination campaigns. Thank you for your continued dedication to the prevention of flu. The Summit looks forward to working with the members of the NIVDP. CDC has issued guidance (see below) to providers who are experiencing difficulty receiving sufficient supplies of the Shingrix™ vaccine to meet demand. SHINGRIX™ DELAYS. As you are aware there are some limits and delays with the Shingrix™ vaccine due to high demand. CDC has prepared the following statement for health care providers related to reminding them on considerations during this time as well as the importance of the 2nd dose. The information is provided for your information and use as appropriate. Be sure to enter your patients’ current vaccination information into your state’s immunization information system (IIS). This will ensure that every provider can access your patients’ immunization record, and it may help facilitate patient reminders to complete the Shingrix™ series. As supply becomes less constrained, be sure to notify eligible patients so they can come in to get their first dose of Shingrix™. Timely series completion is key to the success of any vaccination program and critical to ensuring patients receive the full benefit of their vaccinations. Adult vaccination rates in the United States are consistently lower than the National Healthy People 2020 goals. Barriers to adult vaccination include inconsistency of insurance coverage of adult vaccines and difficulty in accessing vaccines. To help address the gap in adult access to vaccines, in 2016 the Department of Health Care Services — which administers the Medi-Cal program (California’s version of Medicaid) — implemented the All Plan Letter (APL) 16-009, which requires coverage of recommended adult vaccines as a pharmacy benefit. Adult Medi-Cal patients can now receive the vaccines recommended for their age and underlying health conditions, and they can do so not only at a provider’s office but also at local pharmacies, improving access and convenience. This policy brief recommends expanding coverage of all adult vaccines as a pharmacy benefit of all public and commercial insurance plans. 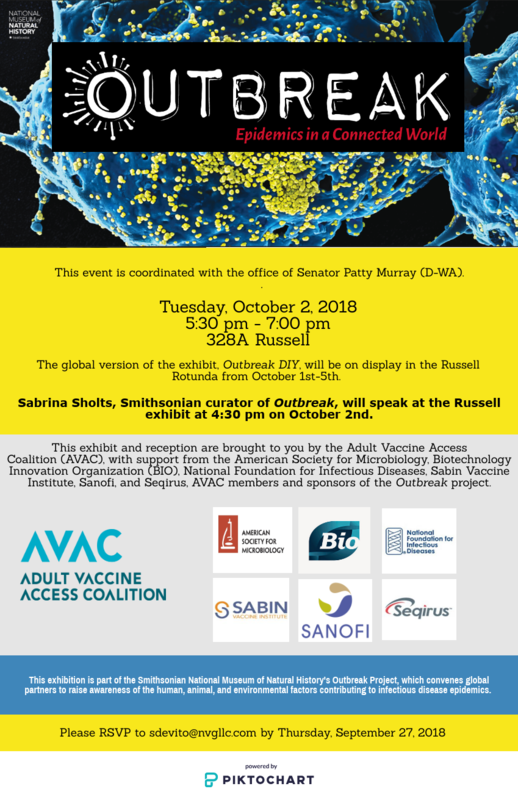 The Adult Vaccine Access Coalition (AVAC) will be holding a reception for Hill staff on October 2. The event will feature a new Smithsonian exhibit, Outbreak: Epidemics in a Connected World. The Hill briefing size is limited to 100 Hill staffers, but all are welcome to the Russell rotunda exhibit from October 1 through October 5th. The Smithsonian Outbreak exhibit will be in place for the next three years. The Centers for Disease Control and Prevention (CDC) is working with federal, state, territorial, and local agencies in response to recent hurricanes. Clinicians assessing patients affected by Hurricane Florence should be vigilant in looking for certain infectious diseases, including leptospirosis, hepatitis A, vibriosis, and influenza. Hurricane Florence made landfall in Wrightsville Beach, North Carolina, on September 14 causing widespread flooding. Natural hazards associated with the storms continue to affect many areas. Infectious disease outbreaks of diarrheal and respiratory illnesses can occur when access to safe water and sewage systems are disrupted, personal hygiene is difficult to maintain, and when people are living in crowded conditions, such as shelters. Health care providers and public health practitioners should be aware that post-hurricane environmental conditions may pose an increased risk for the spread of infectious diseases among patients in or recently returned from hurricane-affected areas. CDC recommends that health care providers treating patients affected by the hurricane consider common infectious diseases like influenza. In addition, physicians should consider less common illnesses, such as leptospirosis, hepatitis A, and vibriosis. All healthcare providers should consider infectious disease etiologies in patients presenting with evidence of acute respiratory illness, gastroenteritis, renal or hepatic failure, wound infection, or other febrile illness. Some particularly important infectious diseases to consider include more common diseases such as influenza, and less common, such as leptospirosis, hepatitis A, and vibriosis. Local health care providers are strongly encouraged to report cases in patients for whom there is a high level of suspicion for leptospirosis, hepatitis A, and vibriosis to their local health authorities, while awaiting laboratory confirmation. Confirmed cases of leptospirosis, hepatitis A, and vibriosis should be immediately reported to the territorial or state health department to facilitate public health investigation and, as appropriate, mitigate the risk of local transmission. While some of these conditions are not listed as reportable conditions in all states, they are conditions of public health importance and should be reported. The first Adolescent Immunization Initiative (AII) fact sheet, The Importance and Potential of the 16-Year-Old Immunization Visit, is now available. A second AII fact sheet, Implementing the 16-Year-Old Immunization Visit: A How-To Tool for Health Care Practices, is expected soon. The fact sheets help raise awareness of the adolescent 16-year-old immunization platform and provide practical implementation strategies for practices. Please feel free to share the fact sheets with peers, as well as associations and organizations with which you are affiliated. Fact sheets will be posted on the AII website. APIC has issued a Consumer Alert, Vaccination saves lives. The Alert highlights vaccine-preventable diseases and why immunizations are so important in preventing these diseases. We are pleased to announce that 2018 World Influenza Conference successfully occurred in Beijing on September 7-10, 2018. The meeting was developed through a global partnership comprising ESWI, isirv, NAIIS, and our Chinese partners the CPMA, China CDC, and the Chinese Academy of Medical Sciences (CAMS). Registration topped 1,200 participants, with more than 15% being international participants. Excellent presentations led to passionate discussion on global pandemic preparedness. There was significant interest on the topic of how seasonal readiness equates to pandemic preparedness. The proceedings of the meeting are going to be submitted for publication as a supplement to a major journal. In the meantime, as presenters provide approval, presentations are being made available online. Vaccination of healthcare personnel in long-term care facilities against influenza has been associated with reductions in all-cause mortality among patients and hospitalizations of individuals with influenza-like illness. This guidance was developed to help leaders and administrators of long-term care facilities increase the influenza vaccination coverage rates of their staff. AMDA – The Society for Post-Acute and Long-Term Care Medicine, representing the community of over 50,000 medical directors, physicians, nurse practitioners, physician assistants, and other practitioners working in the various post-acute and long-term care (PA/LTC) settings, has also supported this guidance and posted it on their website. Additional information is available on the Summit’s web page on vaccinating healthcare personnel and in CDC’s Toolkit for Long-Term Care Providers. The Pediatric Infectious Diseases Society (PIDS), the world’s largest organization dedicated to the treatment, control, and eradication of infectious diseases that affect children, is pleased to announce the availability of a new edition of The Vaccine Handbook App. This mobile App for iOS devices contains the 2018 (7th) edition of The Vaccine Handbook: A Practical Guide for Clinicians (also known as “The Purple Book”), by Dr. Gary S. Marshall, professor of pediatrics at the University of Louisville School of Medicine. This authoritative, practical tool is available free of charge from the Apple iTunes App Store. (Purchase of the print edition is not required). The App may be found by searching the App Store for “The Vaccine Handbook App” or clicking on this link. Additional information about The Purple Book is available through the publisher, Professional Communications, Inc. (West Islip, NY). The 2-day Clinical Vaccinology Course (CVC) sponsored by the National Foundation for Infectious Diseases (NFID) and Emory University School of Medicine focuses on new developments and issues related to the use of vaccines across the lifespan. Poster presentations and interactive sessions led by expert faculty provide the latest information on updated vaccine recommendations and innovative and practical strategies for ensuring timely and appropriate immunization. The 2018 course is scheduled for November 9-10, 2018 in Bethesda, MD. Register now – discounted early registration fees end on September 27, 2018. GSK is seeking assistance from partners to reinforce important education and communication about the storage, reconstitution, and administration of RZV. RZV was approved for use by the US Food and Drug Administration (FDA) on October 20, 2017. As this new vaccine begins to reach clinics and pharmacies, and ultimately patients, GSK has received a small number of reports from the field of maladministration of RZV. These reports of observed usage of RZV suggest that the root cause of maladministration has been the utilization of the storage requirements and route of administration established for ZVL. Since ZVL and RZV have different storage requirements and routes of administration, GSK is asking that Summit partners include in your communications regarding RZV the specific storage and administration requirements of RZV. The FluView report published for Week 33 (ending August 18, 2018) is available on CDC’s website. Also available are CDC’s summary and technical seasonal influenza key points from September 10, 2018. Prevention and Control of Seasonal Influenza with Vaccines: Recommendations of the Advisory Committee on Immunization Practices — United States, 2018–19 Influenza Season appeared in an MMWR dated August 24, 2018. CDC recommends annual influenza vaccination for everyone 6 months and older with any licensed, age-appropriate flu vaccine (IIV, RIV4, or LAIV4), with no preference expressed for any one vaccine over another. More information about the 2018–2019 upcoming season is available on the CDC website. Variant virus infections key points also are available from the CDC Influenza Division. CDC recently released a new FluView Interactive application that displays information collected on human infections with novel influenza A viruses in the United States and allows users to view characteristics of cases and counts by geographic location, virus subtype, influenza season, and calendar year. The site includes data for the current and previous seasons. Full FluView reporting for the 2018-2019 season will resume on October 12, 2018. Regular distribution of key points by email will resume in the fall as well. There have already been six cases of influenza in North Dakota and the flu season hasn’t even officially started. Last season was one of the worst for influenza in North Dakota over the past 20 years with nearly 8,500 cases reported. In a Pharmacy Times video, Troy Trygstad, PharmD, MBA, PhD; Ned Milenkovich, PharmD, JD; Mindy Smith, BSPharm, RPh; John Beckner, BSPharm, RPh; and Brian Hille, BSPharm, RPh, address the shift in need for pharmacists to obtain prescriptions from physicians and the economic value of providing immunizations. Ostensibly, the concept of inequality may have some origins in the viral world, as scientists from the University of Minnesota (UMN) Medical School have recently discovered that the influenza virus does not replicate equally in all cells. The investigators found that not only is the immune system response tuned to the amount of virus replication, it’s also tuned to the viral spread. This deeper and more accurate understanding of the influenza virus and how it spreads could be the building blocks to better protective therapies for patients in the future. Findings from the new study were published recently in PNAS through an article titled Distinct antiviral signatures revealed by the magnitude and round of influenza virus replication in vivo. An additional article is available in Genetic Engineering and Biotechnology News. A single dose of baloxavir marboxil was superior to placebo in controlling influenza symptoms in patients with uncomplicated disease and did not appear to have any clinically significant adverse effects, according to new findings published in the New England Journal of Medicine. An additional article is available in the Infectious Disease Advisor. Researchers at the University of Cambridge and the University of Oxford have discovered a new molecule that plays a key role in the immune response that is triggered by influenza infections. The molecule, a so-called mini viral RNA, is capable of inducing inflammation and cell death, and was produced at high levels by the 1918 pandemic influenza virus. The findings appeared in Nature Microbiology on September 17, and the University of Cambridge issued a press release on this topic. An early stage clinical trial, funded by the National Institute of Allergy and Infectious Diseases (NIAID), has started enrolling subjects at a Vaccine and Treatment Evaluation Unit (VTEU) site at Saint Louis University, Missouri. The Phase l trial is a double-blind, randomised, placebo-controlled study that aims to investigate the safety and immunogenicity of an intranasal influenza vaccine in 50 healthy subjects aged 9-17. Administration of the investigational vaccine, developed by FluGen using a strain of seasonal influenza virus (H3N2), will be followed by licensed inactivated Quadrivalent Influenza Vaccine (QIV). In the temperate zones of the southern hemisphere, influenza activity remained elevated in South America and appeared to decrease in Southern Africa. Influenza activity remained at low seasonal levels in Australia and New Zealand and at inter-seasonal levels in most of temperate zone of the northern hemisphere. Decreased influenza activity was reported in most countries of tropical America. Worldwide, seasonal influenza subtype A viruses accounted for the majority of detections. Call summaries are available shortly after each call on the Summit website. Please email L.J Tan or LaDora Woods if you have any updates on activities to provide to the Summit.